Millions of people all over the world have had the date April 14, 2019 marked on their calendar for a long time. It is the day of the much-awaited premiere of HBO’s fantasy series – Game of Thrones. I had been hearing about the series for years but never really thought to watch it. I am not a huge TV addict and I am also a creature of habit and very particular about the sort of shows that I invest my emotional energy in. In fact, I used to wear it like a badge of honor that I had not watched a single episode from the series and could relate to the memes that supported that reality. But all that changed during a conversation I had over the Christmas holidays when I let it slip that I had never seen a single episode. This declaration was followed by jaw-dropping silence and my dear friend who had been the recipient of this declaration made me promise to give the show a chance. The next morning, I woke up, made myself a cup-of-tea and powered on the TV. Thanks to the good folks at Amazon who have the HBO app (for a fee), I had access to all of the seasons. If anyone reading is a G.O.T fan and remembers the first episode, you can probably understand why within minutes of watching this, I was already swearing off the show and wondering if my friend had a few screws loose to even recommend something so gory for me to watch. Frankly speaking, it confounded my fragile sensibilities. I went back to my dear friend and I think my word were, “I have a bone to pick with you”. She very calmly let me know that one does not watch a show like that first thing in the morning. Talk about ‘How to Watch Game of Thrones 101‘. 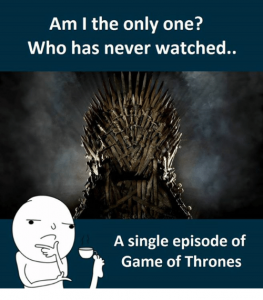 So, later on that night, we watched the first episode together and that was when I discovered that, as one of the many memes put it: One does not simply watch Game of Thrones, one becomes addicted. It was during that time between Christmas and New Year when one does not quite know what to do with oneself, and I think I was able to get through Season 1 and it left me wanting more. While there are parts of the story line that are absolutely horrific and not for the fainthearted, this story is so well-imagined, I came to understand why some many people are addicted to the show. It is gripping to the point that it completely takes over your thought process for several days. As a fiction writer, I am often drawn to stories that are creatively narrated and that come to their coherence in a zigzagged way that it completely blows your mind. This show has tugged at my emotions in ways that I cannot even begin to explain – it has enraged me, it has left me flummoxed, it has heartened me, it has left me at times joyless and at other time ebulliently joyful. 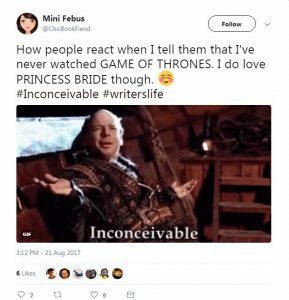 I feel like a bit of a fraud because I binge-watched the show in a matter of weeks when most of the hardiest fans of the show have been crazily committed for years. And now it is getting ready to do it again. As Season 8 premieres on Sunday, I realize that I have been spoiled having enjoyed the luxury of watching the 7 previous seasons, satisfying my G.O.T. hunger whenever I wanted to. Now, I have to watch it like the other millions of people and agonize over the cliff-hangers and make sure I watch it in time before the spoilers start to circulate around the internet. A show of this magnitude has people all over the world eager to share episode updates. 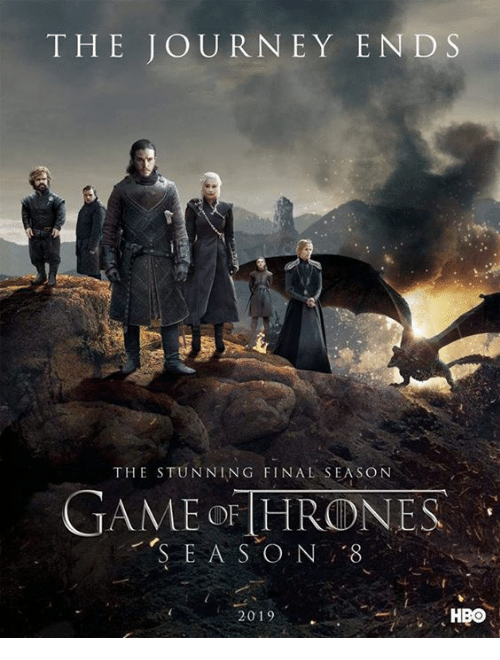 As a late arrival to the G.O.T bandwagon, I am actually a little bit pleased to watch the final season along with all the other long-term fans as the show rides into the sunset to be revived in re-run land for many generations to come.